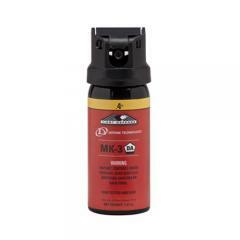 The Def-Tec First Defense MK-3 is a compact, law enforcement-grade pepper spray with enough capacity for seven to ten short bursts. The foam formula is non-flammable and safe for use with Electronic Discharge Weapons. The MK-3 is best used indoors and accumulates on the target, providing powerful facial coverage which reduces the risk of cross-contamination. A safety flip top minimizes risk of accidental deployment. Once activated, the foam solution has an effective range of 4-6 feet. The yellow color band denotes Def-Tec's 0.4% major capsaicinoid formula, produced in their ISO-rated factory and confirmed by independent laboratory testing. SPRAY CANNOT BE SHIPPED BY AIR OR TO A P.O. BOX. ORDER ONLY IF IN THE CONTINENTAL UNITED STATES.